Flamingo the women’s shaving counterpart from razor subscription, Harry’s. Since Harry’s launched in 2013, over a million women have used and loved the products. To a collective of women on the Harry’s team, it became clear that we could create Harry’s-quality products designed for the ways women were actually using them—like on their legs, underarms and bikini lines. Good to Know: Flamingo is not a subscription, but is the female-marketed equivalent of shaving subscription Harry’s. In additional to being online, they can be found at brick-and-mortar retailers as well. Ships to: US for free. When you receive your order, you’ll get a card that explains their credo. Everything included in the set comes in a purple-hued square reusable pouch with snap closure. It fits everything perfectly but can, of course, be used for anything you’d like. Like many razor companies, theirs comes in a very nicely branded box. Even though you’ll keep your handle and only purchase the blade heads, your first one comes assembled. There’s even a little message as you slide the box open. When you order, you’ll get to choose from three different colors. I went with the subtle taro with rose gold. The handle has a nice weight to it (like Harry’s, it’s heavier than Billie but not as heavy as Dollar Shave Club) and is wrapped completely in a thin grippy rubber and includes the simple flamingo logo. The rose gold accents appear to be metal and are on the end as well as the neck, closer to the blade head. The underside has some swirls stamped into it to provide extra grip when you’re in the shower. They only have one kind of head and it has 5 (Swedish steel) blades, along with a strip of aloe at the top. I honestly didn’t even notice that this was part of it until I had used it and noticed a difference. It was smooth and felt like hard plastic. I’d say it isn’t as obvious as the Billie strip and a little sleeker. This gave me a very close and clean shave and looked good while doing it. In the shave set, you’ll also get an extra 5-blade head replacement for future use. It comes in a small plastic tray to protect it until you’re ready. Like Billie, Flamingo also comes with a holder for your new razor. There’s has a suction cup instead of a sticky pad which sadly refused to stick to my porous shower tile. Boo! I still used it on the side of my tub to rest the razor on and keep it out of puddles though. Like all of the other shaving brands, they offer a product to help slide things along with ease. Flamingo’s comes in the form of a foaming gel. As soon as you squirt a bit out (it comes fast, watch out!) it immediately turns into a foam and puffs up. That means a little bit goes a long way which is good because this 1-ounce bottle doesn’t seem like it will last longer. Of course, it’s just a trial size, so I wasn’t expecting much. I do like the fact that they include it in their set. I think it’s a smart move. It’s made with aloe and has a pleasant feminine scent that is nice but a bit floral for me. I also prefer creams to foams for shaving, so I personally probably wouldn’t get this again. It did aid me with shaving and allowed the blade and aloe strip to glide along my legs and underarms with ease. I think this one is just a personal preference call! The Verdict: I think Flamingo provides a great product with some extras that are helpful without being overwhelming. They value their $16.00 kit at $22.00, but once I added it all up I came up with $14.70 minus the cost of the holder since it isn’t available (which, sure, could be worth $1.30). While this doesn’t quite add up, it’s the only way to try their lotion + shave gel without buying full sizes, so it makes sense. Shipping was also free, although you can just pick this up at some brick + mortar retailers as well. Can you still get this box if you sign up today? Yes! It’s not a subscription but this set is available anytime online and in many stores. Value Breakdown: For $17.12 ($16.00 + tax) I got a reusable handle, 2 shave cartridges, and a suction cup holder, and a travel size of their shaving gel and lotion to try. Check out more shaving clubs in the Women’s Subscription Box List! How do subscribers rate Flamingo? Do you subscribe to Flamingo? Add your rating now! I haven’t tried this razor yet but I’ve been using Dollar Shave for almost 2 years and LOVE it!! I like the heavy weight of the razor and I get the closest shave ever. I tried this razor this week and absolutely hated it!! I was in Target and was actually intending on buying refill cartridges for my schick hydro silk razor when I saw these and decided to pick one up because of the price (I hate how expensive the refills for the schick are!) the first shave? Great! Zero problems! But the ones after that progressively went downhill. The “aloe strip” was basically dry after the first use and the razor itself would randomly tug and pull on my skin, which ended up causing me to nick myself in a VERY sensitive area where you def don’t want a cut! It was also really hard to get a close shave and the position of the aloe strip made it bulky and harder to maneuver. But the worst part is I think one of the ingredients used in the aloe strip caused an allergic reaction because my under arms are inflamed, red, itchy and painful! I’ve read some other things online of people who have reported similar things. Idk what the issue is but definitely going back to my schick. 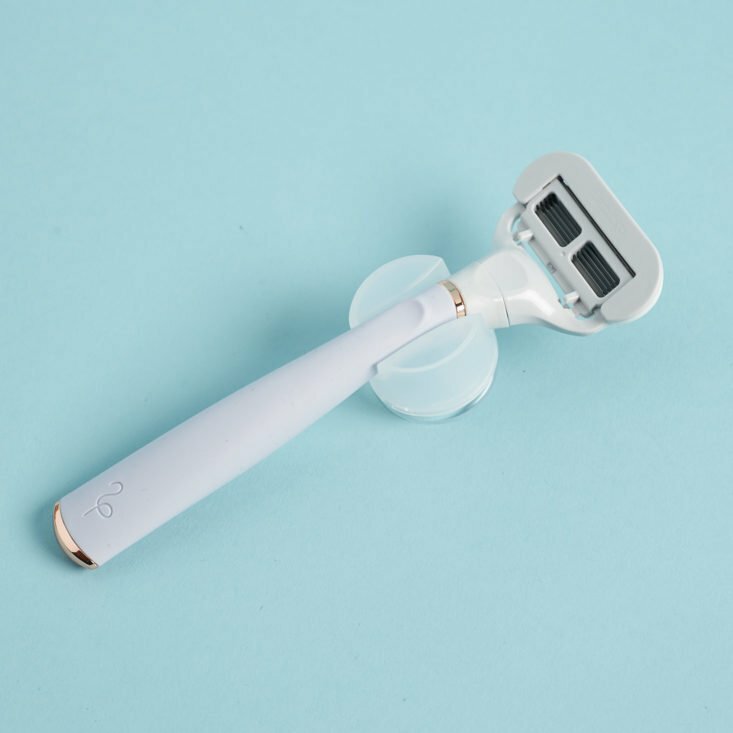 I’ve tried both Billie and Flamingo and I feel like Billie gave me a smoother shave, the ravor was easier to maneuver, and I liked the magnetic holder better than the suction cup one. Billie has a nice razor, however they NEVER have any of their other products in stock. I realize you said you did not need the other items, however my daughter and I do!😉My husband has used Harry’s for a couple of years now and loves it. I am going to check out Flamingo’s starter box for my daughter and myself. It is good that there are a variety of companies to meet all the different needs/wants! I’ve never had an issue with Billie’s razors being out of stock, but the extra products (shave cream, lotion, etc.) are frequently in and out of stock. I have only tried Gillette and Flamingo. I like the aesthetics of Flamingo much more, but that “hard plastic” aloe strip still puzzles me. How is it technologically possible to make that? I’ve heard about vitamins-infused pantyhose, but I am rather skeptical about it. Anyway, I like how Flamingo does its job. Thanks for the review! I’ve been exploring the different shave clubs for women and have read the Billie reviews. After reading this one on Flamingo I think I’ll go ahead and try Billie. It has the more substantial aloe strip, plus I already have plenty of my own shaving creams and lotions. I don’t see why I should pay $7 more for two trial/travel size products. That Flamingo kit price must come from the overly inflated retail value and/or a little of that “pink tax” thrown in 😉. Billie’s great too though! I hope you find the perfect one for your needs! Awesome! Thanks so much for the info! Thank you for reviewing these products. I’ve been curious to try Flamingo since I see it advertised so frequently on social media. After seeing your review…I’m off to order my own starter set! Glad I could help, Kris! The logo designer is a genius! It’s minimalist but clearly a flamingo. Cool.